If you prefer to use Dashlane on your computer only, without any synchronization between devices or access to the web app, and want us to delete your data from our servers, simply disable Sync from your Windows or Mac OS X application. Your encrypted data will then be deleted from our servers and only stored locally on your computer. To do this, go to Tools > Preferences on Windows or Dashlane > Preferences on Mac, then go to the Sync tab and disable Sync. Please note that once Sync is disabled, you will not be able to use your account data on more than one device. When you add a password on one device, it will not be synced to your other devices. First, uninstall Dashlane from your computer. Click here to learn how to do this. 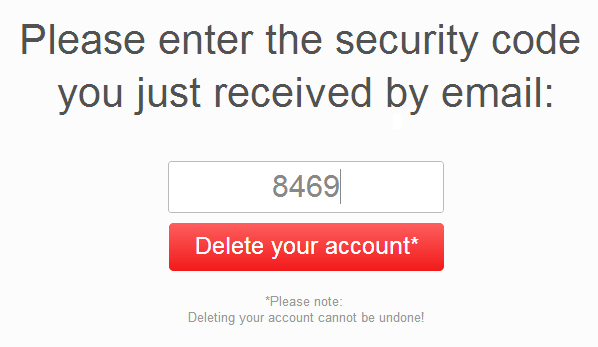 Then, go to the delete page and follow the instructions here to delete your account and your data from our servers. Once you have done this, you will not be able to log in to your account anymore. Simply deleting your account on the web page will not automatically remove Dashlane from your computer. Similarly, removing Dashlane from your computer will not delete or reset your account, as it will still exist on our servers. You need to do both in order to fully leave Dashlane. It would be great if you took a minute to explain to us what you did not like or what disappointed you in Dashlane and made you want to cancel your account. This will help us understand and learn from this, so please don't be shy!